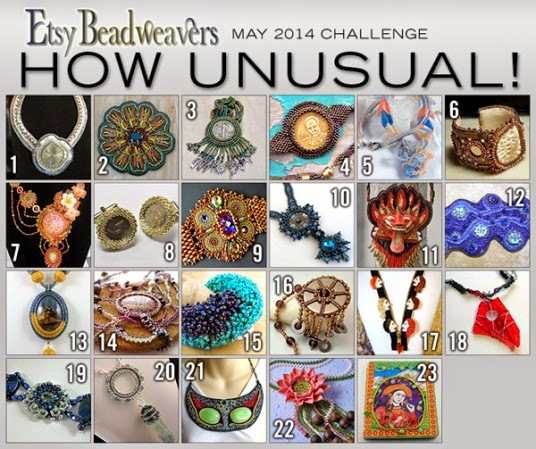 May challenge theme from the Esty Beadweavers Team is: How Unusual! "Let's use the most unusual items this month! Besides your normal beading items (seed beads, crystals, gemstones, etc. ), your entry for Maymust have at least one unconventional item. Look around you - on the street, in nature, in your kid's room (dolls, dice, playing cards, etc.) or in a man's world (screws, tools, bolts, bullets, animal eyes or teeth, etc. ), or anything else you have not thought so far could be part of your beaded projects. Just think Out of the Beading Box and be innovative!" You can visit the team blog and vote for your favorite piece until the 16th, please try to take the time to singularly visit each entry and I promise you will be amazed by the details and the unusuality!! !